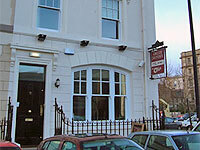 Jolyons opened for business in 2004 as Cardiff's first boutique hotel. Jolyons is situated alongside Roald Dahl Plass in the Cardiff Bay area. Its location makes it an ideal base for visitors who are planning to catch a show at the Wales Millennium Centre, which is literally a stone's throw from the hotel. Jolyons offers six luxurious en-suite guest rooms, with WiFi Internet access, TV and tea & coffee making facilities. In the basement of this hotel you will find a cosy little bar, called Bar Cwtch, which is a great place to relax.